/MOSCOW, September 23. /TASS/. The Israeli Air Force and those making decisions are solely to blame for the crash of Russia’s Ilyushin Il-20 aircraft in Syria on September 17, Russian Defense Ministry Spokesman Major General Igor Konashenkov said at a briefing on Sunday. According to him, "objective data says that the actions of Israeli pilots, which led to the death of 15 Russian military personnel, point to either lack of professionalism or criminal negligence." "This is why we believe that the Russian Il-20 aircraft tragedy is solely the fault of the Israeli Air Force and those who made decisions concerning such actions," Konashenkov said. He stressed that on the night of September 17, the Israeli fighter jets "were active in an area that both military and civilian aircraft fly through when landing at the Hmeimim air base." According to Konashenkov, it is hard to understand the reasons behind these actions, taking into account constructing cooperation between Russia and Israel in Syria. "This is an extremely ungrateful response to all that Russia has done for Israel and the Israeli people recently," he said. "The Israeli military command either does not value the current level of relations with Russia or does not control certain military units," Konashenkov noted, adding that the Israeli Air Force’s actions towards the Russian aircraft went beyond civilized relations. Konashenkov pointed that the Israeli F-16 fighter jet’s pilot knew that Russia’s Ilyushin Il-20 aircraft would be a preferred target for Syrian air defenses. "After the first attack, the Israeli jets pulled back, moving to an area 70 kilometers west of the Syrian coast, turning their radar jamming devices on and apparently making preparations for another attack," he added. According to the Russian defense ministry spokesman, at 21:59, one of the Israeli F-16 fighters headed to the coast, approaching the Il-20 aircraft, which was preparing to land. "The Syrian air defenses must have taken that maneuver for a new attack by the Israeli Air force," Konashenkov noted. The Israel Defense Forces claimed earlier in a statement that "when the Syrian Army launched the missiles that hit the Russian plane, IAF [Israeli Air Force] jets were already within Israeli airspace." "The Israeli pilot could not but understand that since the Il-20 aircraft has a far larger radar cross-section compared to an F-16 jet, it would be a preferred target for air defenses," Konashenkov said. He also noted that Israel was aware "Russian and Syrian militaries use different friend or foe identification systems so Syrian radars could have identified the Il-20 as a group of Israeli fighter jets." The Russian defense ministry spokesman pointed out that "the Israeli fighter jets used the Russian Il-20 aircraft as cover against missiles and continued their maneuvers in the area." A missile launched from a Syrian S-200 missile complex hit the Russian Ilyushin Il-20 aircraft at 22:03 on September 17, the aircraft commander had the time to report about the fire on board and the start of an emergency landing, Igor Konashenkov said at a briefing. According to him, Israeli fighter plans in fact used the Russian aircraft as cover, knowing that air defense missiles would hit a larger target. "At 22:03, a Syrian missile hit the closest and biggest target, which was the Il-20 aircraft. The captain reported about a fire on board and the start of an emergency landing," he said, adding that the aircraft had disappeared from radar at 22:07. The Russian defense ministry spokesmen noted that the mode conduct of Israeli pilots in Syria was totally different from that of US pilots, as Russia and the US used communication channels to notify each other of plans to carry out air operations in the region in order to prevent incidents. Konashenkov went on to say that Russia had not once violated its agreements with Israel "and never used the Russian air defenses deployed to Syria though Israeli air raids sometimes posed a potential threat to Russian military personnel." "Since the [deconflition] agreement was made, Russia has sent 310 notifications about activities in areas along the Israeli border to the Israel Defense Forces Command. At the same time, Israel sent only 25 such notifications, shortly before airstrikes," he said. He added that Israel’s F-16 fighter jets turned their radar jamming devices on and pulled back after carrying out an attack in Syria’s Latakia province on September 17. "Syrian air defenses began launching missiles to counter Israeli airstrikes at 21:51," Konashenkov said. "After the first attack, the Israeli jets pulled back, moving to an area 70 kilometers west of the Syrian coast, turning their radar jamming devices on and apparently making preparations for another attack," he added. 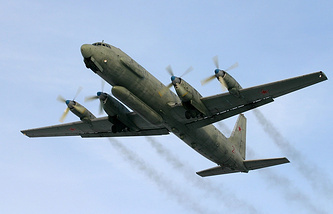 According to the Russian Defense Ministry, on September 17, contact was lost with a Russian Il-20 aircraft flying over the Mediterranean Sea back to Russia’s Hmeimim air base in Syria. The ministry said the aircraft had disappeared from radar during an airstrike four Israeli F-16 fighter jets carried out on targets in the Syrian province of Latakia. On September 18, the Russian Defense Ministry stated that the Il-20 aircraft had been accidently downed by Syrian air defenses as the Israeli F-16 jets had been using it as cover. According to Konashenkov, Israeli pilots "could not but see the Russian plane, which was approaching the runway from an altitude of five kilometers." The Defense Ministry added that it considered such actions by Israel to be hostile.